The September 14th Big Brother TV show is a mad extravaganza of drama and delight. 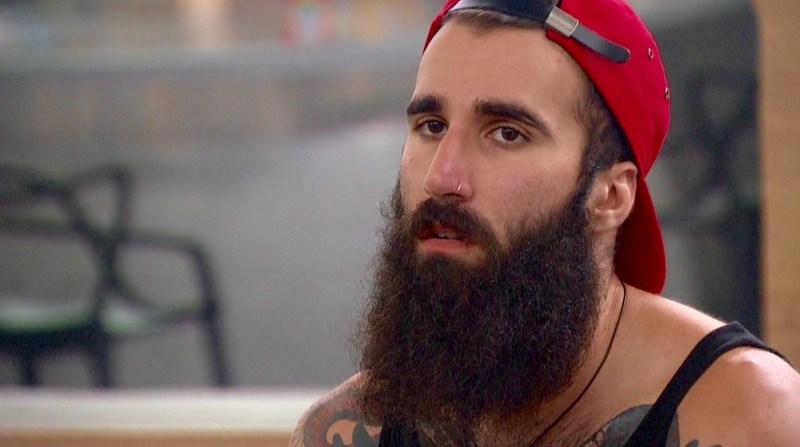 It starts out with Paul’s tears when he wins the HOH. “I’ve had it tough since day one… talking my way through things…” Yes, it has been a long road and when he says, “That one’s for you, Victor!” our spidey sense tells us we might actually have emotions too… for a millisecond anyway. Yes, we shed a tiny tear. Then we see a convo between James and Paul from the night before Victor was evicted. The two of them decide to fight together because strategically they really don’t have any other choice against glued-together Corey and Nicole. Simply for the sake of numbers Paul and James need each other. 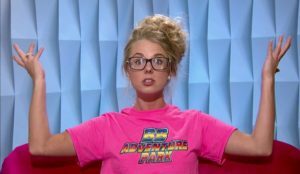 Right after this Paul puts Corey and Nicole on the block, she for the very first time. James points out that it’s really as if they’re all on the block (other than Paul as HOH) because the Veto means everything this week. It’s the final Veto and the sole houseguest off the block after the Veto concludes is also the only vote. Big Brother visits the jury house next. Michelle paints portraits of Nicole with a snake body while Bridgette and Day seem aligned against Zakiyah and Paulie. 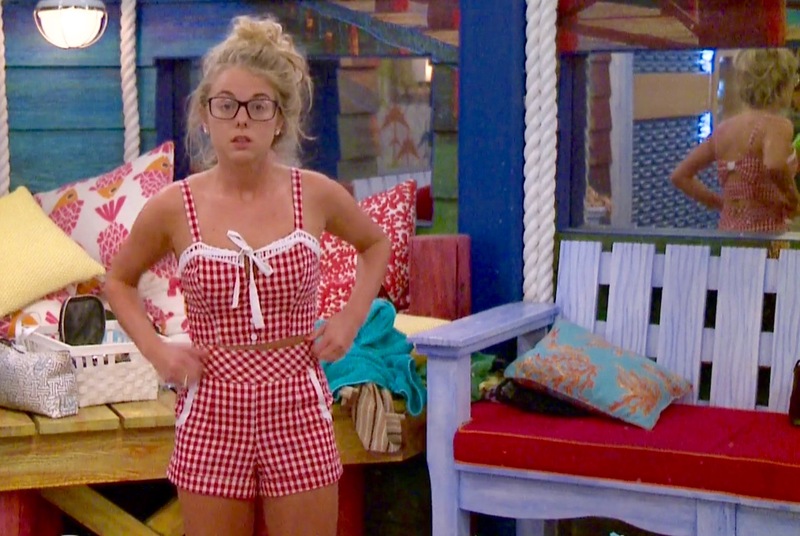 So, it’s a jury house divided when Natalie enters. Then as Nat Nat shows the jurors her video of events from the BB house, Da’Vonne and Paulie go head to head in a nasty shouting match. It’s rather grotesque… and not just because of Paulie’s hair. He decided to go back to his Pee Pee look and thus endanger any possibility of a handsomeness revival. He does, however revive that sarcastic clap when things finally cooled a bit and he was completely douched out. News alert, Paulie, you’re the only one clapping. Victor then joins them in the jury where it appears the jurors are making lots of arts and crafts, including word necklaces like “powerful” and “courage” which the ladies wear. He shows them the video of Corey winning HOH and explains the Final Four alliance situation and then the jurors watch the BB comics competition. 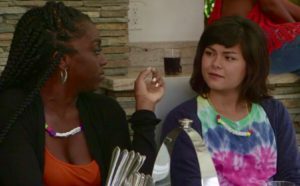 Michelle is a real trooper about her comic and then Da’Vonne gives Nicole props for all her competition wins. Looks like those necklaces are doing the trick! See kids, words can change the world. Guess who sucked at another comp? The Veto competition worries us at first glance. It’s BB baseball! Oh dear. Right on cue, Corey says, “This could be my field of dreams,” and we groan inwardly. But all isn’t lost! Turns out it’s the days-in-the-house challenge. That means if a houseguest has been paying close attention to what happened on what day in the Big Brother house this summer, they’ll likely do well. Paul pays attention – yay! It’s no surprise that James has no strategy and doesn’t know the days. He’s out in no time. Nicole’s out next. Then it’s a tight race between Corey and Paul until the best surprise win of the summer – Baseball Veto Winner = Paul! We’re so happy for Paul, just Paul and only Paul. 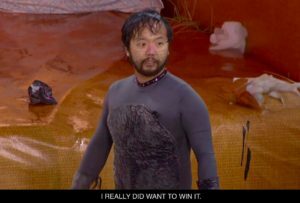 He dedicates this win to Pablo, his floaty pelican. No surprise because Pablo served as Paul’s favorite belt much like Victor’s battle back belt. They’re the well-belted bros, after all. Next live on the September 14th TV show, Paul chooses not to use Veto. James makes his vote after Nicorey’s predictable farewell speeches and Corey goes to jury. He seems surprised James evicted him when he talks to Julie. Also Corey says he and Nicole will be “best friends for a long time” and possibly they may continue the romance, “We’ll see how it goes,” which is a lot more positive than he ever got in the house discussing the prospect with his bros. This Friday there’s another special episode at 8pm EST with the final HOH competition. Then Wednesday September 21st brings the live finale of Big Brother at 9:30EST. Congratulations to the final three! We’re happy that there’s not a showmance among them and look forward to these three maybe actually getting to know each other a bit. 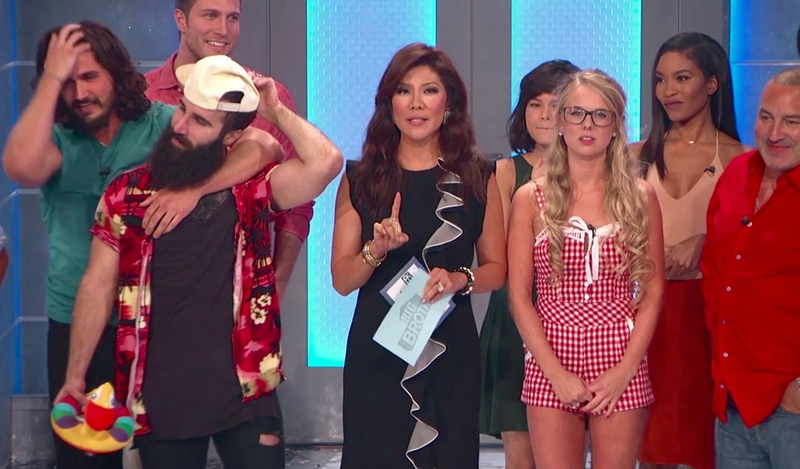 Although, Paul DID get pretty tight with almost all the houseguests this summer. He was playing Big Brother the entire time. That’s why. At the onset of the September 13th TV show Paul tries to salvage his situation with Nicorey. He asks them if Victor or he can win the Veto could they continue to work together and try to get James out? …but it’s not gonna fly. The Final Four is finished. All for the better, Paul. You can do this without them. We believe in you. Next we see the BB Comics Veto competition. 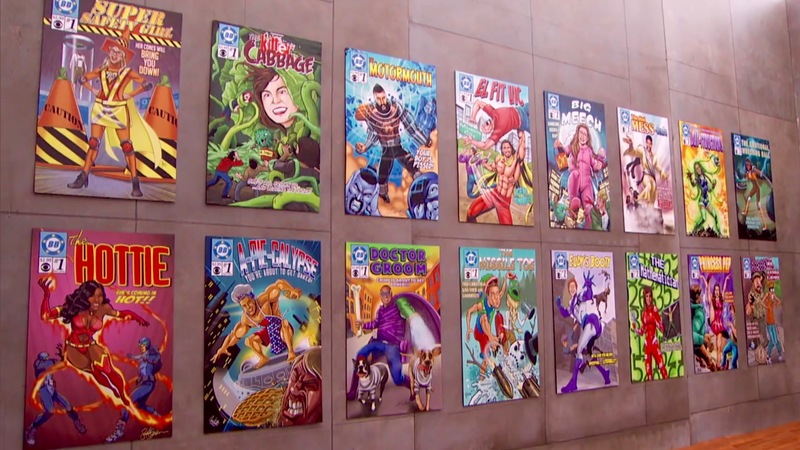 Each houseguest gets a comic book cover with their superpower matching their character. It’s a matching game where details are incorrect in some of the comic book covers and correct in only one of them. The more detail-oriented they are the better they’ll do. Paul narrates this one for us and takes us through the competition as attempts the challenge. The comics look amazing and are funny too. The art looks so professional because Big Brother has actual comic book artists design and draw them. 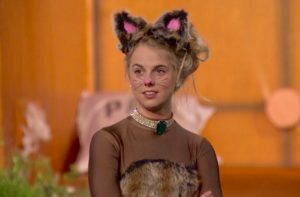 As we already knew, Nicole wins Veto and by quite a bit too – five whole minutes. She then chooses not to use it, (no surprise) and thus seals the fate of her former alliance members – Vaul. In their goodbye speeches Paul makes everybody laugh with appropriate mockery. Victor also jokes with each of them about their backstabbing ways but it’s all in love and jest. Then Nicole and James vote to evict Victor again. Goodbye to our beloved Puerto Rican Sensation. We will miss you SO! Julie says, “We have to stop meeting like this, Victor,” while he’s amused and surprisingly good-natured. Victor admits it was smart for Nicorey’s game to evict him. He realizes his biggest mistake throughout the game is that he tends to trust other players too much. We hope Victor gets a chance to use this lesson learned and play the game again. he’s perfect for an All Star season. Next we see the HOH competition “What the Bleep,” in which the houseguests watch video of their fellow houseguests as they face eviction night. Their farewell speeches in the video clips each contain a bleeped word and the competitors guess what it was. 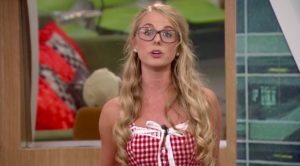 Nicole takes the lead for awhile with great guesses until Paul catches up right at the end and then it’s tied between them. 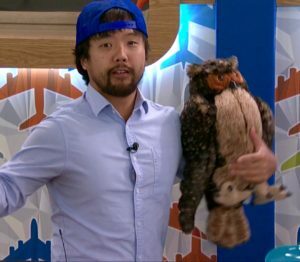 In the end of the competition Paul guesses the number about an event in the house most correctly and wins the HOH! We’re extremely happy and even more so that Paul heard the studio audience going crazy happy cheering for him that he made the final three! 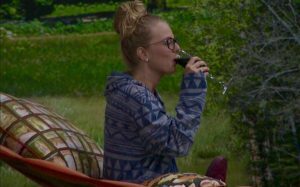 We know from a tiny bit of feeds on the evening of September 13th that Paul put Corey and Nicole up on the block for eviction. 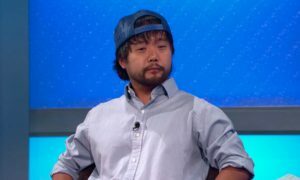 Stay tuned to Fetchland.com for a recap of the Wednesday night episode of Big Brother. It’s down to the wire now, bros; only a few episodes and houseguests left!. 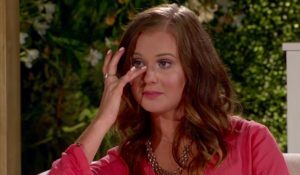 The feeds are down until after we (likely) find out that our beloved Puerto Rican Sensation permanently left the building on the Tuesday night special show. 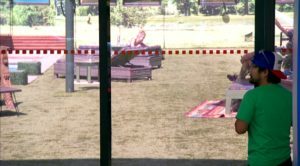 So, there’s not much to say about the Big Brother house feeds for September 12th. 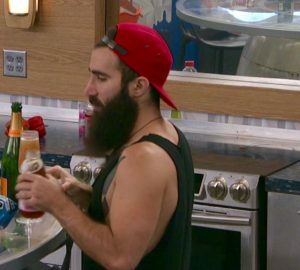 Instead we’ll play a matching game – current BB18 houseguests to phone apps. Who matches what?… and why? Well, lucky you, we’ve got answers to these crucial and life-changing questions. Music. You need it. You want it. It’s a welcome part of your everyday experience. Music’s likely one of the first apps you click on your phone to escape the daily doldrums out there in the world and drift into that favorite song or playlist. It takes you to a better place. 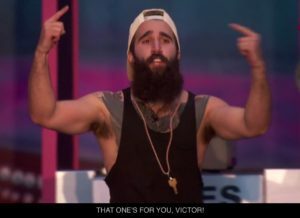 Victor brings this same feeling to the Big Brother 18 house. Maybe it’s because he left and came back, so we missed him… twice. One of those you don’t know what you’ve got until it’s gone type-things. 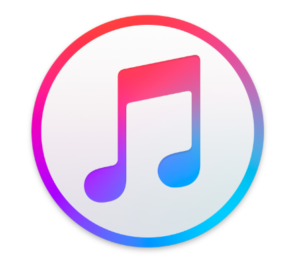 Imagine if you woke up one morning and your music app was gone. You’d sure as heck miss it. That’s how we feel thinking that Victor’s gone and most likely how Paul feels too. In fact, Paul probably feels it double duty because he’s a guitarist stuck in the house without his guitar. Music left Paul on every level. Paul’s really into friendship. We know that for certain. But there’s so much more to Paul than that. 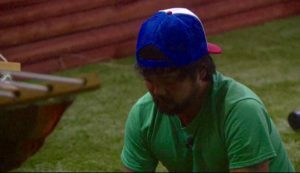 Up till Zingbot shamed him out of his sayings, Paul’s all about blazing words like a firestorm in the BB house. He coins catchphrases and shouts them, to the roof with joy. Also, Paul loves to get into debates with people – likely because he usually wins. The guy won’t back down when it comes to words and we love that about him. 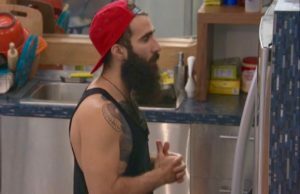 He keeps the BB18 house cookin’ and it’s not just about makin’ muffins anymore, folks! Paul’s great with words and a terrific friend. He’s that friend who tells you the harshest truth in a way you can really hear it and even make you laugh at your own faults. Paul connects with people because he sees the flaws in himself and laughs then too. That’s true friendship. Remember when the Apple Watch first came out? 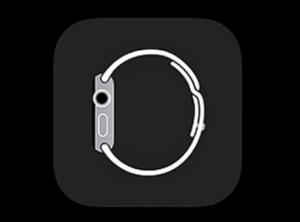 We never got an Apple Watch either… yet we still have that damn Apple Watch app on our phone. In fact, we’ve long suspected that app may be the reason our phone drains so much faster now. Started happening right after it showed up in our apps – coincidence? It’s a leech app – contributes nothing and drains drains drains all our battery’s energy. Worst of all, it won’t delete. We can’t get it off our phone. It refuses to budge no matter what we do. Meanwhile it does NOTHING. Sound familiar? Yes, that’s right. We just described James. The nice thing about the Apple Watch app, though, is that at least we can hide it way in the back of the third page in our “infrequent use” file where the tumbleweeds blow. If only we could do that with James! He just stays in there eviction after eviction. We can’t even keep hope alive for his exit because Lame James never even goes on the block. Ever played Tic Tac Toe? Sure you did. We all remember it. But funny how it’s a distant memory for us all, isn’t it? 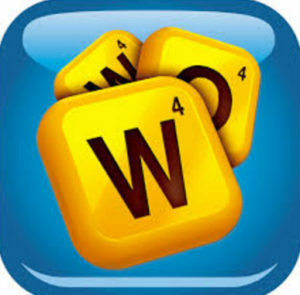 Nobody plays after awhile because it’s the same darn thing, a one trick pony of a game. A chicken can play and even win consistently. Sound familiar? Yeah, that’s Nicole and her game strategy. 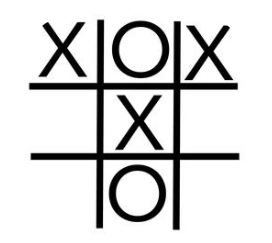 The days of yore, when Tic Tac Toe challenges you and Nicole’s merely cute and quirky are long gone. It looks like she might even make final three this season. Some feedsters suspect production cajoled Nicole in certain directions and perhaps even assisted her gameplay. That could be true, we don’t know. We actually don’t really care because either way, she’s lost her midwestern luster in our eyes. We still think she’s cute, of course, but in the same way a chicken winning Tic Tac Toe is. Sure, adorable.. but it also reminds us how downright simple humans can be. Corey never fails to bore us to death. We actually die most days when we see him and stay that way while he’s onscreen. It’s like a whole Flatliners scenario every time. Usually Paul serves as an adrenaline shot to bring us back to life after we flatline out of Borey Corey Boredom. 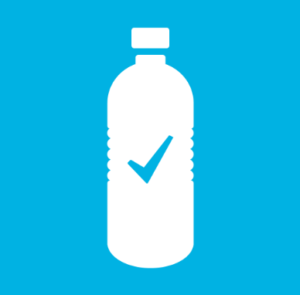 So, the app that reminds people to drink water every day is a perfect icon for Corey. Is it really that hard to remember to drink water? No. You can’t possibly need this. You will DIE without water. Survival instinct will kick in at some point and you’ll drink it. Period. Corey reminds us of a stereotype, not a real person. He’s sporty and attractive. He loves Christmas and dogs. What else do we know about Corey? He’s a frat boy. It’s all SO enthralling. Look, we know there’s probably more to Corey. Of course there is. He has to be more interesting than this! That bottle of water has a meaningful check mark on it granting it a tiny sense of mystery… and Corey has a sense of mystery too. That’s why Nicole keeps asking him about his secret. Even in her puppy love state of adoration about Corey, she assumes there must be more to him. Tuesday the Big Brother TV show airs, so we’ll be back to our regular brand of posts here at Ruining Big Brother on Fetchland.com but we hope you enjoyed this special edition as well.